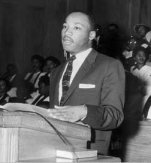 This week, several occasions, from prayer breakfasts to fun runs, are being organized to mark the anniversary of the famous American civil rights leader, Martin Luther King, Jr. His birthday is now celebrated as a National Holiday in the United States. Over the years, the Black American minister’s legacy has gradually become an integral part of the universal conscience, appealing to people of every nation, race and ethnic background. During his lifetime, he championed the cause of the oppressed masses of the United States, particularly ethnic minorities. Martin Luther King was born on January 15th, 1929. He is known to have been one of the main organizers of the famous “March on Washington” in 1963, which brought together some 250.000 people. On that historic occasion, he delivered his “I Have a Dream” speech in front of the Lincoln Memorial - a speech which has now become a reference for several political leaders and freedom fighters all over the world. On the evening of April 4th, 1968, Dr. King was assassinated on a motel balcony in Memphis, Tennessee. One James Earl Ray was later arrested for his murder. But up till present day, there are still lots questions in the air concerning the real brain behind the minister’s assassination. JAPAN UPDATE will carry a special editorial next week on Martin Luther King’s universal appeal.